Blessed by the complete trio of ocean, mountains, and rivers, Kochi Prefecture in Shikoku offers a wealth of attractions throughout the four seasons of the year. The prefecture faces the Pacific Ocean and has a long coastline stretching east to west, so its ties to the sea run deep. And with a warm and rainy climate, it boasts abundant nature too. Indeed, Kochi’s mountains have the highest woodland ratio in the whole of Japan. The following is an introduction to Kochi’s nature and its blessings, lifestyle, culture, and other features focusing on the central and western parts of the prefecture, which I recently visited. 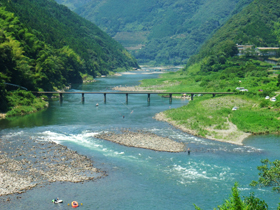 The Shimantogawa river, which flows in the western part of Kochi, is one of the prefecture’s representative rivers and the longest in Shikoku. 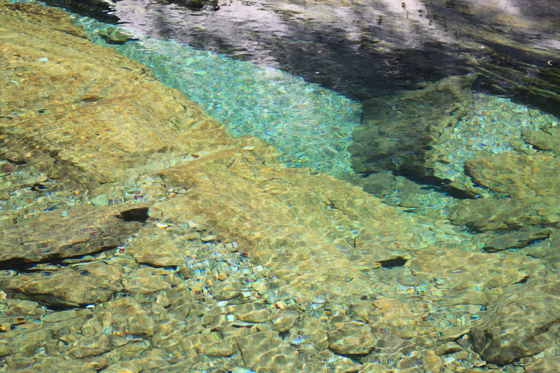 Together with the Nagaragawa in Gifu Prefecture and the Kakitagawa in Shizuoka Prefecture, the Shimantogawa has a reputation as one of the three clearest rivers in Japan. It has also been selected by the Ministry of the Environment as one of the Selected 100 Exquisite and Well Conserved Waters in Japan. 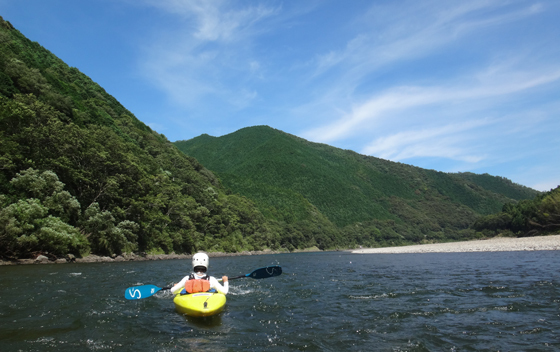 The Shimantogawa flows so gently that the blue sky and green mountains are reflected on the surface of the water. The course of the river meanders sharply, and at the turns the riverbed widens so that the water flowing downstream is cleansed as its passes through the stones and sand on the riverbed. 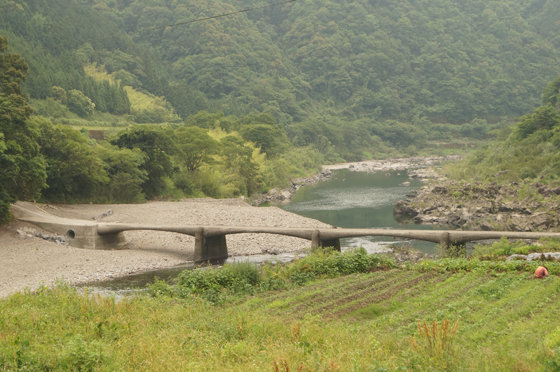 Another reason for the Shimantogawa’s limpidity is that there are no large dams to hold and stagnate the water. There are about 140 species of fish inhabiting the Shimantogawa, including ayu (sweet fish), prawns, and eels, which can be caught by a rod or other technique. Many fishing fans flock to the river to catch the high-quality fish raised in its clear waters. 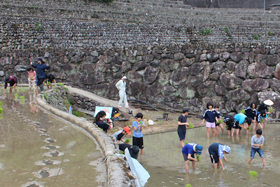 The Shimantogawa really is the heart of the river basin culture, providing local people with irrigation water for their farms, enabling them to enjoy fishing, and bringing them into contact with nature. There are pleasure boats on which tourists can enjoy the local cuisine. But if you want to get a real taste of the nature here, I recommend you to take a canoe ride downstream, which brings you as close to the surface of the water as you are likely to get. As the canoe passes through a canyon-shaped part dwarfed by the two sides of the river, there are no artificial objects to be seen in the vicinity at all. All you can hear is the sound of the flowing water and chirping birds. This encounter with genuine nature can be experienced throughout the year. Visitors can enjoy the splashy course as well. The bottom of the canoe has a stabilizer, so even first-timers don’t need to worry about capsizing. 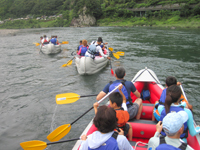 Rafting for families with kids is available too. 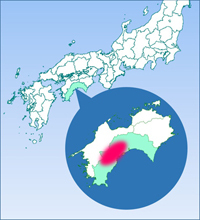 Kochi Prefecture is a region of heavy rainfall brought by typhoons. Even the water level of the Shimantogawa, which usually flows so serenely, can rise 10 meters or more in a torrential downpour. One product of the wisdom of people living in the vicinity is the chinkabashi (submersible bridges) that cross the river and have become a feature of the prefecture. The chinkabashi have low girders, so when the water level rises, they sink into the river, thereby weakening the pressure from the flowing water. They have a simple design with no railings as well, so they do not break up even when high water levels bring along driftwood and other flotsam. 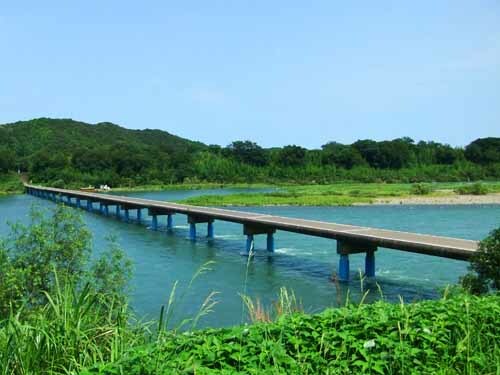 Woodland accounts for 84% of Kochi Prefecture’s area, and originally these chinkabashi bridges were built around the prefecture in Japan’s postwar period of rapid economic growth to enable trucks carrying timber felled in the mountains to cross the rivers. They are made of concrete and wide enough for only one vehicle to pass. 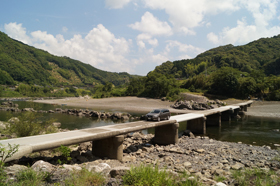 In recent years larger bridges have been built, and the chinkabashi are gradually disappearing with age, but there are still 47 of them along the Shimantogawa serving the needs of the local people. 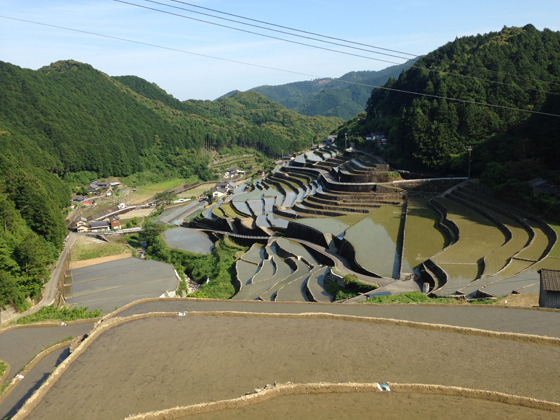 Viewing them or playing on them, they are an integral part of the Shimantogawa landscape. The chinkabashi is just wide enough for one vehicle to pass. The white part is a repair of part of the bridge that collapsed. 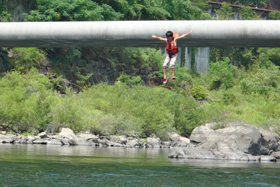 The bridge is quite high for children, so they need a bit of pluck to dive from it. 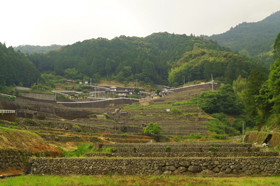 Kochi Prefecture, with the highest woodland ratio in Japan, has very little flatland, so in the past people utilized the natural topography and developed terraced rice fields on the sloping mountainsides. The sturdy stonework assembled by local people generations ago gives a curvaceous beauty to the mountainsides. The picturesque sight of these layers of terraced rice fields of all sizes touches the hearts of the Japanese and has been cherished as pristine rural scenery. Work on these terraced rice fields is much harder than flatland work. Since only small machines can be used, tasks take longer and require a lot of manual work to cope with the irregular terrain. Raising efficiency is extremely difficult. Throughout Japan there is a shortage of successors willing to take on this backbreaking work, and the farmers who are doing so are not getting any younger. The rise in the number of farming households abandoning arable land has become a serious problem. During my visit I went to the Kainokawa district of Tsuno-cho town, where, because of aging, the number of farming households abandoning fields is increasing year by year, but nevertheless the local community is continuing efforts to eliminate idle land and maintain the beautiful scenery. The just planted seedlings are green and fresh-looking. The lower stone walls are said to have been built in the Kamakura period (1185–1333). 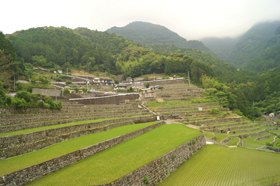 In order for the local people to cooperate and continue maintaining the rice fields, the local Kainokawa Terraced Rice Fields Preservation Society is endeavoring to maintain the fields, build local bonds, and create an atmosphere of vigor and purposefulness through exchange. Two activities that have yielded results in enlivening the community are a candle festival and a terraced rice field ownership scheme. Five thousand candles glitter in the Terraced Rice Field Candle Festival. The Terraced Rice Field Candle Festival began in 2009 as an attempt to invigorate the local community. People were awed by the fantastic beauty of the event, which has taken root as a major autumn festival in Tsuno-cho held every year in October. With the cooperation of local children and students, the whole community gets involved in making candle stands, which are assembled by cutting two-liter plastic drinking bottles in half. 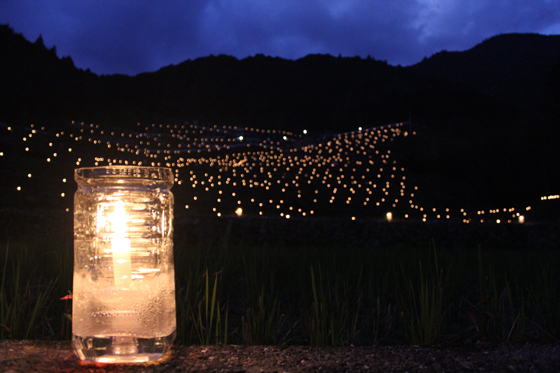 Five thousand candles are placed on the rice field ridges. 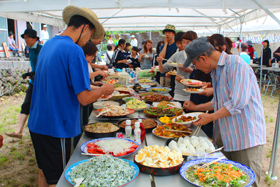 The festival attracts more than 4,000 spectators, including not only local folk but also people from outside the prefecture and from Kochi City, as well as people who hail from Kainokawa but have moved away from the area. Although organized by just 35 farming households, the festival has become the biggest event in town. The fact that such a small community has drawn such a large number of visitors is a great encouragement for them. The candle festival is definitely not staged for tourist purposes. To the end, its objective is to unite the community and publicize the present state of the terraced rice fields. Owners are invited to lend a hand throughout the year. After the field work has finished, owners and farmers get together for exchange. In an effort to maintain the local scenery and also to display community spirit, the terraced rice field ownership scheme was launched in 2012 with the aim of preventing important rice fields that farmers had been forced to abandon from becoming idle land. Under this scheme, owners do not only receive harvested produce in exchange for their investments. Local farmers take care of the machine work and everyday upkeep, but the manual work is done by the owners and their families. At the time of major tasks like rice planting and harvesting, the owners and farmers work together, and then afterward they all get together for a hearty lunch. The owners look forward to this opportunity for exchange and a taste of the local cuisine. “Without this kind of exchange, I don’t think the ownership scheme would be very interesting at all,” stressed Mr. Tateo Osaki, representative of the scheme’s organizers. This effort by the local farmers has got on track, with the owners empathizing with the objectives and renewing their contracts every year. These owners are looking for things that money cannot buy—the clean water and air of the natural environment, the sounds of birds and other animals, exchange with the local people, and so forth. These activities are initiated by the local people with the purpose of enabling them to continue living vibrant lives. They have the jovial nature of a high school cultural festival, embracing insiders and outsiders alike. And the outsiders are very much attracted by this local vitality. 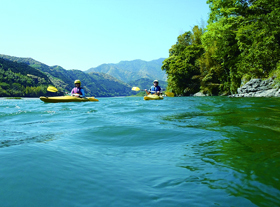 Another representative river of Kochi Prefecture is the Niyodogawa, which boasts the highest water quality in Japan and unparalleled transparency. The water of this river, which attracts people with its almost mystical beauty, is nicknamed the “miraculous clear stream.” It is bluish (the distinctive color is called “Niyodo blue”), and abundant and untouched nature remains in the river basin. Dotted with chinkabashi bridges, the Niyodogawa is a precious river that retains the pure sparkle of Japan’s waterways. Tosa Tengujo-shi washi, known as the “wings of a mayfly,” is thin and strong. 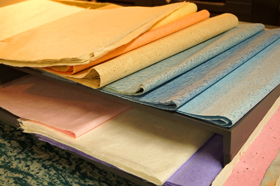 The manufacture of washi (Japanese paper) using local materials and clear water developed in Ino-cho in the Niyodogawa basin more than 1,000 years ago. Eventually, centering on this town, the manufacture of washi achieved spectacular development throughout Kochi Prefecture thanks to the improvement, ahead of other producing regions, of paper-manufacturing tools aimed at the increased production of high-quality paper and a positive response to the introduction of Western culture and technology in the Meiji period (1868–1912). From the later Meiji period into the Showa period (1926–89) Kochi Prefecture boasted the highest production of hand-made washi in Japan. The texture of washi made by hand according to elaborate and mature traditional techniques is highly praised as an expression of the unique aesthetic of Japan. 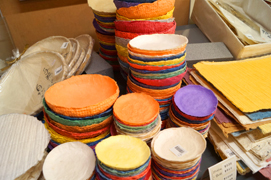 One of the features of Tosa washi is that while traditional techniques have been carried on, a search has continued for new forms of manufacture and as a result a variety of washi has been produced. 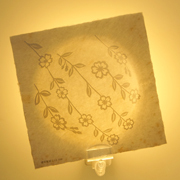 Of the hand-made paper produced by original techniques cultivated by craftspeople over generations, Tosa Tengujo-shi is the ultimate washi in terms of thinness and toughness. At just 0.03 mm, it is the thinnest paper in the world. Until the mid-Showa period large quantities were exported to Europe and the United States for use as typewriter paper. 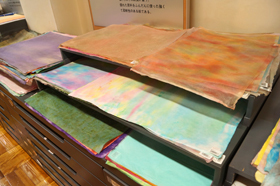 Today it is used for the production of art and craft goods, such as chigiri-e (torn paper art), and also for the restoration of cultural property. 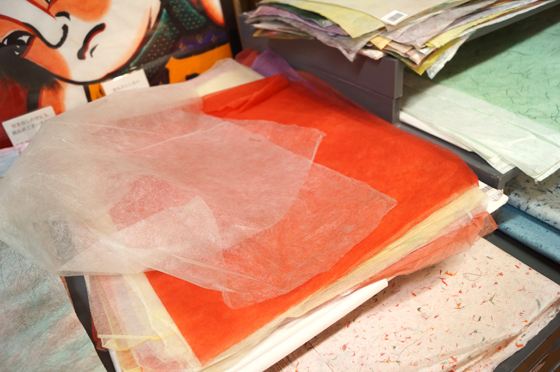 Many other types of washi are manufactured as well for a variety of uses, including thick paper, glossy paper, stiff paper, and colorful paper.